Council has undertaken an investigation of the reopening of Bowraville Bellingen Road over Bowra Mountain as an access fire trail. A feasibility report on the proposal has been lodged with RMS. The estimate of cost for the proposed works is approx. $1.5M which exceeds the $1M that was originally proposed by RMS. The RMS has been asked to increase the allocation to cover the total cost of the proposed works. Council is currently waiting for a response from RMS. It should be noted that the proposal outlined by the RMS, in their letter of 13 August 2013 and confirmed in their offer of funding for investigation dated 10 Feb 2015, is for the closure of the subject section of Bowraville Bellingen Road as a Public Road. This will mean that on completion of the works to reopen the road as an access fire trail, this section of road will no longer be part of Nambucca Shire’s local road network and will not be eligible for any further funding from the RMS in any future natural disaster or road funding program. Council received a letter from the Roads and Maritime Services (RMS), dated 10 February 2015, offering “as a guide” up to $1m for environmental works associated with the road closure. The funding can also be used for the construction of an access fire trail. RMS offered to make available initial funds for scoping and estimation work associated this expenditure. Council engaged a contractor for the removal of vegetation which has now been completed. A survey and investigation of landslips and drainage infrastructure has been carried out by Councils Surveyor. Regional Geotechnical Solutions were engage to provide advice on landslip remediation options and Civil Engineering Contractors have been consulted regarding suitable construction methods and costs. Drainage catchment analysis has been carried out and a proposal for the augmentation of the existing road culverts has been prepared. Cost estimates of Drainage, Landslip Remediation and Road Resurfacing works have been prepared, estimated to be $1.5M. A feasibility report has been presented to RMS with a recommendation that the project proceed. Consultation with NPWS, RFS and Forests NSW confirmed that the appropriate level of service was a fire trail suitable for a Category 1 Fire Truck (13 tonne). The Rural Fire Service provided guidelines on road geometry required for a Category 1 Fire Truck and these guidelines have been used as the basis of Councils proposal. The report concluded that the proposal is a reasonable and cost effective undertaking to provide security for the residents of Spicketts Creek. The opening of a fire trail provides access for Emergency Service vehicles and an escape route to the south for residents. The Feasibility Report is attached. The implications for the environment have been previously reported and were considered in the Value Management Workshop. The social implications have been previously reported on and were considered in the Value Management Workshop. The economic implications have been previously reported on and were considered in the Value Management Workshop. The proposed investigation work will be funded by the RMS. The closure of the road and conversion to a fire trail will have an impact on future and lessen the depreciation within Councils assets. There will be staffing resources required to liaise with NPWS and manage a contract and day labour to undertake various aspects of the proposed work. $190,925.00 allocation for investigation. Funds totalling $1,000,000.00 allocated by RMS for restoration. For over 120 years the Bowraville to Bellingen Road has provided a connecting link between the two communities. The original bridle trail across Bowra Mountain connecting the communities Bowraville and Bellingen was constructed in the 1880’s. In 1901 a grant was approved for the building of a road. Improvements and repairs were made to the road in the 1920’s. In 1924 it was gazetted as Main Road (MR) 118. The most recent traffic data, obtained in 2006, registered Average Annual Daily Traffic (AADT) of 82 vehicles per day in the section between Helliwells Road and Spicketts Creek. The records indicate the road has a history of damage and delayed repairs over the last century but nothing on the scale of damage that occurred in February and March 2009. A period of extreme rainfall occurred from mid February to late March 2009. February is statistically the wettest month for this region with and average of 200mm. However three times the average monthly rainfall occurred between 13 Feb and 18 Feb 2009, causing several failures on the stretch of road through the Bowraville Nature Reserve. Nambucca Shire Council closed the road until repairs could be undertaken. Above average rain occurred again in late March, climaxing with an extreme storm event on the night of 31 March with high winds and anecdotally up to 780mm of rain overnight. This storm uprooted many trees and caused further landslip damage to the already closed road. GHD Pty Ltd was engaged by Nambucca and Bellingen Councils to investigate the damage to the road and proposes options and cost estimates for remediation. The document “Preliminary Investigation & Assessment Report for the Landslip Damage on Bowraville to Bellingen Road (MR18)” was released in March 2010. “Preliminary Options Report for the Landslip Damage on Bowraville to Bellingen Road” followed in September 2010. These studies focused on the goal of reopening of the Bowraville Bellingen Road to the standard of an unsealed Main Road with unrestricted public access. The cost of such a restoration of the road was estimated to be $14.3M. This cost was deemed prohibitive and has not been pursued by RMS. In August 2013 Council expressed interest in having the road opened as a walking and cycling track. The NPWS had also expressed interest in having the road opened as a 4WD trail to provide access for maintenance of the Bowraville Nature Reserve. In February 2015 RMS proposed to provide scoping funds to investigate the feasibility of reopening Bowraville to Bellingen Road as a 4WD Access Trail. A cost estimate was prepared and Council resolved at the meeting of 25 June 2015 to accept an offer of $190,925.00 from RMS for planning and survey works. The road is unsealed construction passing through steep mountainous terrain. The vertical alignment is a gradual incline from both the north and south to the high point at the junction with the Valley Valley Trail. The horizontal alignment is serpentine as the side cast cut and fill construction follows the hillside around ridges and gullies. Major gullies have piped culverts discharging the uphill catchment under the road and into the natural flow path downstream. The Bowraville Nature Reserve is the most significant natural feature adjacent to the subject section of Bowraville-Bellingen Road. Except for sections added in 2003, the nature reserve has not been harvested for timber in the last 100 years. Blackbutt and Tallowwood are the predominant species on the upper slopes adjacent to the road. Flooded Gum and Subtropical Rainforest occur on the lower slopes and deeper gullies. The district has a warm temperate Climate. Rainfall averages 1457mm per year with the wettest month being February with an average of approximately 200mm and the driest month being September averaging less than 50mm. The extreme storm event which caused damage to the road is reported to have dumped up to 780mm overnight on 31 March 2009 This was preceded by 600mm between 13th and 18th February. The Bowraville-Bellingen Rd traverses steep mountainous terrain. The south side of Bowra Mountain drains into Missabotti Creek while the northern face is part of the Spicketts creek catchment. The slopes into which the road is cut are typically steeper than 35deg. Approx. 1.4km of the subject section of Bowraville-Bellingen Road passes through the Bowraville Nature Reserve. Approx. 1km is bounded by Gladstone State Forest. Two privately owned rural allotments also bound the north and south extents of the affected section. Predominant rock type is moderately weathered phyllite. The main ridgeline runs to the east from the Bowra Mountain. The road skirts the south side of the ridge, rising as it moves north east. It crosses the ridge at the junction with Valley Valley Trail and continues north west on the northern side of the ridge. Gravely clay residual soil overlies the bedrock. This overlain with transported soils. The landslips have generally occurred at the bedrock soil interface, typically 1 to 2 deep. The Bowraville Nature Reserve has not been logged since 1962. The original 54 hectares has been protected since 1907. The Bowraville Nature Reserve is dominated by Blackbutt, Turpentine and Tallowwood with Flooded gum occurring in the lower slopes and deep gullies. It is predicted that threatened species of Rusty Plum and Red Boppel Nut occur within the Nature Reserve. Vulnerable Species recorded in the Bowraville Nature Reserve are Koala and Yellow-bellied Glider. It is predicted that the following vulnerable species also reside in the reserve: Stephen’s Banded Snake, Powerful Owl, Wompoo Fruit Dove and the Grey Headed Flying Fox. It is also predicted that the Endangered Giant Barred Frog resides in the reserve. The nature reserve and forest bounding the Bowraville-Bellingen Road are within the traditional lands of the Gumbaynggirr people. There are no registered Cultural sites within the vicinity of this section of the Bowraville-Bellingen Rd. The Bowraville Local Aboriginal Land Council has confirmed there are no significant heritage features likely to be disturbed by the proposed works. The road itself has Cultural and Historical Significance as the route taken by women travelling from Bowraville to Bellingen Hospital to give birth. Some gave birth en route. The Bowraville Bellingen Rd provides access to the Bowraville Nature Reserve. The nature reserve and view from the crest of the ridge provide a glimpse of the natural beauty of the area. As is the case with many rural roads the constructed road is not fully contained within the surveyed road reserve. For the purpose of this proposal the ‘road’ will be deemed to be a 20m wide corridor centred on the nominal centreline of the constructed road. If adjacent landholders, principally NPWS and Forests NSW, are interested in boundary adjustments to coordinate survey boundaries with the constructed road this can be pursued at a later time. · Desktop investigation of the site. · Consultation with other stakeholders. · Preparation of REF for the on-site investigation activities. · Clear road of fallen trees and landslip debris to allow access for 4WD survey vehicles and small plant. · Inspection and assessment of existing drainage culverts, and requirements for replacement and augmentation of drainage. · Determine required drainage works and prepare cost estimates. · Survey road and landslips. · Determine appropriate remediation for each landslip and preparation of cost estimates. · Determine extent of roadworks and prepare cost estimates. · Prepare report for Council and RMS regarding feasibility of the project progressing to construction. The report will consider what level of service the proposed access track will provide, what restrictions to access should be imposed and how this can be managed. The following sources were referenced in order to determine the site details and limitations. This project has a number of Stakeholders. Council has attempted to include all interested parties in the process of developing an appropriate proposal for the reopening of Bowraville Bellingen Road. The Bowraville Nature Reserve is managed by the National Parks and Wildlife Service of NSW. It is a highly valued reserve as one of the few areas in the North Coast that have not been subject to logging for over 100 years. The Bowraville Bellingen Road runs through the reserve and is the major route of access for weed management and fire management of the reserve. National Parks and Wildlife Ranger, Martin Smith, met council representatives on site. A record of the meeting is included in Appendix A. NPWS are supportive of the proposal to reopen the road as it will provide access for NPWS Rangers to maintain the adjacent Bowraville Nature Reserve. Concerns expressed included the protection of the adjacent reserve during construction works and the safety of NPWS staff using the fire trail. The Gladstone State Forest is managed by Forests NSW. The subject section of Bowraville Bellingen Road provides the only vehicular access to the south eastern quadrant of the Gladstone State Forest. The road forms a vital part of fire management strategy and a restored access track would provide connectivity for fire services operating in the eastern and western sides of the forest. This connectivity is vital for the safety of fire management personnel. Forest management would also be enhanced by the restoration of the road, allowing connectivity for inspections of the forest. There is no proposal to make the restored road available to log trucks. The proposal to restore the road as an access track is supported by Forests NSW. The NSW Rural Fire service is responsible for the management of fires on private property on both sides of Bowra Mountain. In the event of a forest fire the RFS works in coordination with Forestry NSW and NPWS. The road forms a vital part of fire management strategy and a restored access track would provide connectivity for fire services operating in the eastern and western sides of the Bowra Mountain. This connectivity is vital for the safety of RFS volunteers. The proposal to restore the road as an access track is supported by NSW RFS. The RFS have provided a specification for the standard of road required for a Category 1 Fire Tanker (13 tonne). This specification has been used in the concept design for restoration works. The community Spicketts Creek is part of the Nambucca Shire. Currently they have no direct access to the rest of the shire. The Spicketts Creek community has only one access in and out, traveling north toward Bellingen. In the event of a natural disaster or other emergency situation there is only one route available for emergency vehicles or as an escape route for residents. A bushfire approaching from the north would leave them with no means of retreat. The restoration of the Bowraville Bellingen Road would provide an alternate access providing a greater measure of security for residents. Council has provided regular updates on the progress of the projects. Communication with residents has primarily been though Mr David Wallin. Council has also provided updates to Ute Schulenberg of Fairfax Media, in order to keep the community informed of the ongoing progress. The proposal to restore the road as an access track would be welcomed by the community of Spicketts Creek. The Aboriginal Community of Bowraville has a long history with the Bowraville Bellingen Road. In the mid 20th Century, mothers due to give birth and others requiring medical attention regularly traversed the Bowra Mountain road to seek medical attention at the Bellingen Hospital. Some mothers gave birth along the way. It is important to the Bowraville community that the Bowraville Bellingen road remains trafficable so that younger generations can understand the life of their elders. The Bowraville LALC supports the proposal to restore the road. Attached is a record of Councils meeting with the Bowraville LALC. Since the landslips and closure of the road vegetation had grown freely on the road surface and in soils transported by the slips and deposited on the road. The vegetation consisted of grasses, shrubs and small trees. Some trees are up to 90mm dia. In some places the road was almost impassable on foot and landslip scarps were obscured. In order to properly survey the road and landslips and access remediation options the road has to been cleared of vegetation. Quotations were invited and the job was undertaken by Arbpro tree Specialists. Vegetation was cleared with brush cutters and chainsaws. A tracked forest mulcher was used to mulch the waste. Vegetation was cut at ground level leaving roots to prevent migration of soils. Tree trunks were cut into manageable pieces and moved to locations within the road reserve where they will not cause obstruction. Particular care will be given to identifying fallen tree trunks showing potential for habitat. Tree sections with habitat potential were lowered into the forest below the road, avoiding damage to existing native vegetation. Numerous piped culverts carry stormwater under the pavement along the subject section of road. Most were found to be damage by the landslips and most have the inlets fully blocked by slip debris. Some culverts have had pipes dislodged on the downstream slope. An assessment has been made of the condition of the culverts and the capacity of each culvert in relation to the upstream catchment. Where landslip debris and soil was obstructing passage for survey operations the material has been excavated and stockpiled within the road reserve. Erosion and Sediment Control measures are in place to prevent migration of soils from stockpiles into adjacent forest. Stockpiles will be covered with geofabric. ESC measures are being monitored and maintained to ensure continued protection. 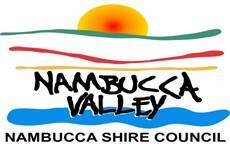 Nambucca Shire Council Surveyor has undertaken a survey of the constructed road and plot its position in relation to property boundaries. A detail survey has been undertaken of each landslip site to determine the extent and type of remedial works required for each location. Existing drainage infrastructure was also identified in the survey. Nambucca Shire Council Surveyor has plotted a proposed road reserve following the course of the existing constructed road. This data could be used to formalise the road reserve if required by adjacent landholder. It is proposed to restore the road to the minimum standard of a Fire trail suitable for a Category 1 Fire Tanker generally following the guidelines provided by the RFS (Policy No 2/2007 Fire Trails). Regular wider sections for passing are included in the design. The road is to have a min 4m pavement with a 3% crossfall into the table drain. A min 1.0m shoulder on the downslope side of the road. A minimum radius of 10m was used to align curves. These minimum requirements were used to determine what restoration was required at each landslip site. Minimum Road Cross section details. Twenty separate landslip sites have been identified that require remediation. Council has sought to determine the most suitable and cost effective solution for each site. Each site has been identified by a Chainage number for reference. Council engaged Regional Geotechnical Solutions to carry out a preliminary non-invasive investigation and make recommendation regarding suitable methods of remediation. Council has also sought advice from Civil Engineering contractors Pan Civil, who carried out a site inspection with Council representatives. The majority of the sites will be suitable for reinforced earth construction with the extent of excavation being minimised by the existing bowl shaped scoured landslips. There is adequate material on site to provide backfill. This is thought to be the most cost effective method. The Vegetated face will blend with the surrounding landscape. NWPS will be consulted regarding suitable seed to vegetate the face of the Terramesh units. Some overly steep sites where some road width needs to be recovered will suit a soil nail and shotcrete solution. A few sections require shallow edge reinforcement and gabion baskets are thought to be the best option at these locations. A list of sites and relevant details are included in appendix B. An inspection of the existing drainage infrastructure has found most culverts have been damage and would require complete removal and reinstatement. Additional culverts at more regular intervals will reduce the load at existing culvert locations and reduce scour on the tabledrains. It is proposed to abandon most of the damaged culverts and install new PE pipe culverts and concrete inlet pits. A summary of the proposed pipe locations and details of the respective catchments are included in Appendix B. An amount of $192,925 was requested and approved by RMS as funding for the investigation stage of this project. At this point in time only $40,925 of this funding has been spent. This in due to several factors; firstly a vegetation clearing contractor was engaged at a considerable saving from the original quotation; secondly council has undertaken various aspects of the investigation at our own expense. Council is keen to have this project completed and have demonstrated this commitment by contributing the costs of preparing the REF, undertaking the survey, road and landslip design and drainage analysis. Construction Estimates The projected cost of the proposed works are summarized below. A more detailed cost breakup is included in Appendix B. Road Resurfacing – 100mm overlay of road base. Bowraville-Bellingen Road has been a connecting link between the communities of Bowraville, Spicketts Creek and Bellingen for over 100 years. The road also provided essential access for the management of the Bowraville Nature Reserve and for fire management activities in the Gladstone State Forest. The road was closed in 2009 after a severe rain event caused extensive damage. The Objective of this project is to reopening the road as public access for pedestrians and cyclist and as an access trail for NPWS and Emergency Services. There are no viable alternate routes in the vicinity. The alternative is to do nothing and leave the road permanently closed. If remediation work is delayed, the road will once again become overgrown and the greater the cost of remediation at a later time. Council is strongly committed to having this project completed for the benefit of all stakeholders. The projected costs are much less that previous, more ambitious proposals, and are a reasonable and justifiable expense to restore this vital and historic link between the Nambucca and Bellinger valleys. The conclusion of the investigation is that the Restoration of the Bowraville Bellingen Rd is feasible for a reasonable cost. Council request that RMS allocate the additional funding required to complete this project. Today I have met with Martin Smith from NPWS to walk over the closed section of Bellingen Road to assess the possibility of opening the road as an access trail for Emergency vehicles (RFS), NPWS maintenance vehicles, and a public walking and cycling trail. The affected section of road is approx. 1.3 Km and runs through the Bowraville Nature Reserve. 1/ Eliminating further Environmental Damage to the Nature Reserve caused by erosion and transporting of soils. 2/ Safety concerns for NPWS staff and public who would use the trail. There had been a misunderstanding regarding Councils request for a walking trail. I reassured Martin that Council also wanted a trail suitable for vehicle access. The affected section of road has several sections closed by fallen trees and approximately 15 small and 5 large bottom side landslips caused by water flowing across the road due to blocked or ineffective drains. Some pipe culverts have been lost down slope. Large sections of the road are now completely overgrown, vegetation mainly rooted in slump material that has been deposited on the road. The revegetation is preventing further soil loss but water is continuing to erode the face of existing landslips. NPWS has agreed to the vegetation being chipped and dispersed down slope. Soil and other spoil would need to be removed and disposed of in an appropriate manner outside the Nature Reserve. There is a 20m wide road reserve through the nature reserve but as with most rural roads the constructed road does not entirely follow the road reserve. The NPWS are not interested in making an issue of this. They consider the road reserve to be 20m wide, centred on the nominal centreline of the constructed road. This consideration gives us scope to repair the road without boundary conflicts. It was also discussed what level of risk would be acceptable to NPWS for a access trail to be used possibly once or twice weekly. It was suggested that the level of risk could be reduced by having a load limit and by having a protocol in place to not use the road during and for several days after rain events above a rainfall threshold ; eg. 100mm in 48 hours. As discussed briefly this morning, please find attached the NSW Bush Fire Coordinating Policy 2-2007 Fire Trails. Whilst a quick read of the overall Policy may be of some benefit, I believe Annexes A and E will provide the information you are chasing in relation to vehicle dimensions and associated fire trail design requirements. The Policy also provides an oversight of Fire Trail Classification in NSW (Page 2). Whilst not currently on the local fire trail register, the Bowraville – Bellingen Road would undoubtedly be regarded as “Essential” (refer definition provided in Policy), i.e. a fire trail without which fire response and suppression in the area would be severely compromised – as currently is the case in this area. In relation to the Bowraville – Bellingen Road itself, this has always been an important access link for fire prevention and suppression purposes (along with other non-fire related emergencies). Not only does the current lack of through access compromise operational efficiency for fire management purposes, it also potentially compromises the safety of firefighters, i.e. only one way in and one way out. We’ve also had a number of instances since the road closure where firefighters have been dispatched from the wrong side (Bellingen v’s Nambucca), thereby significantly affecting response time and potentially increasing the risk to properties (and associated lives) in the area. Whilst it may be possible to obtain a joint submission from the Lower North Coast Bush Fire Management Committee (Nambucca + Kempsey LGAs), which would include input from all 4 NSW fire authorities, the feedback above is provided on behalf of the NSW Rural Fire Service. I do believe, however, both the NPWS and Forestry Corp would undoubtedly echo my concerns. Please advise whether you require any further assistance or information in relation to this matter. Attendees: Phillip Hall CEO Bowraville Aboriginal Lands Council, Stephen Fowler (Engineering Designer NSC), Reno French (Community Development Officer NSC). - Stephen Fowler stated the Nambucca Shire Council is looking at opening the road as the emergency trail for the Fire brigades to use in case of emergency as well as a hike and bike trail. The road may not be used as a public vehicle access road at this time which also depends on funding. - Stephen has said that the council is here to consult with the local community before further development, the council would like to know if there is any cultural significance on the and/or any artefacts that would prevent the clean-up of the trail. - Phillip Hall had stated that there is significance to the local Aboriginal women due births that had occurred there and the road as the local trail for the Aboriginal women to get to the Bellingen hospital. - Phillip had asked if for the proposal to be given to him in writing so that he could introduce the proposal at the next LALC meeting. Stephen stated he would do that and follow up with that. - Stephen Fowler had advised Phillip that any cultural artefacts or significant objects found while cleaning the area would force the work on the road to cease. - Phillip had stated that Local people have come into the office saying they would like the trial to be open. Stephen: to follow up with the proposal information and send onto Gary. Next steps in moving forward; Where to from here? - Clear and remove trees and unnecessary dirt, it would take two to three weeks to clear out the road. - Tree will be put on the side of the road as not to damage any current animal habitats. - Stephen had stated that they would give the information for the main landslide areas that are affecting the road and put in a submission for those to be fixed. - Stephen will prepare a REF and send the copy to Phillip and the Bowraville LALC. - Stephen to send REF to Gary/Bowraville LALC. Council has received a request from the Gordon Park Tennis Centre Committee of Management for an Interest Free Loan of $70.000 (seventy thousand dollars) to be repaid over a period of 10 years to expedite the construction of a new tennis club house. This item also relates to Item 9.3 within the business paper (request to waive DA fees for the construction of a new tennis club house) and Item 11.2 (Capital Works report which defers the construction of the new public toilet amenities block subject to further public consultation). Should Council provide a loan for the construction of a new tennis club, the old amenities block will then be demolished. That Council provide an Interest Free Loan to the Gordon Park Tennis Centre Committee of Management for $70.000 (seventy thousand dollars), to be repaid over a period of 10 years and Council enter into a Deed Of Agreement including the Loan Repayment Plan. The Nambucca Heads Tennis Club received a $16,000 interest free loan from Council in 2002 to assist with the re-carpeting of two tennis courts. The loan period was for two years and the club repaid that loan in 18 months. During the period 2012 and 2014 the Tennis Club and the Gordon Park Tennis Centre Committee of Management expended close to $107,000 on the courts and clubhouse, principally on replacing the carpet on four courts, with 57% of these funds stemming from their own resources, and the other 43% generated from grant funding. The Gordon Park Tennis Centre Committee of Management presently has $70,000 in their bank account to put towards the new tennis club house. However as it could potentially take some years to secure grant funding to match their funds and they have requested Council assistance to provide an amount of $70,000 via an interest free loan to expedite this project. NOTE: An amount of $10,800 is available in voluntary labour for the project within Stage 1 and is also subject to Item 9.3 within the business paper with Council considering the waiving of the DA fees associated with the project. There is no impact on the environment associated with this report. Council has approved the relocation of the tennis club and amended the Master Plan and change included in the Management Plan. The tennis club provides social outlet for the community and visitors to the Shire. There are economic implications for the tennis club as they have made a commitment to repay the loan over a ten year period relying on membership, court hire and grants. There is a potential risk that the tennis club may default on the payments, however they have more than demonstrated that they are financial and have the capacity to repay the loan and have met their previous loan commitments for the upgrade to the tennis court surface. There will be a direct impact to the current budget with Council providing the $70,000 from working funds, and an income stream for future budgets for the repayment of the loan. Funds would be provided from working funds.